Marquette has six newcomers this season and is looking to turn over a new era as they move on with life after the Big Three. One of those newcomers that will have to come in and step up right away is junior Dwight Buycks. 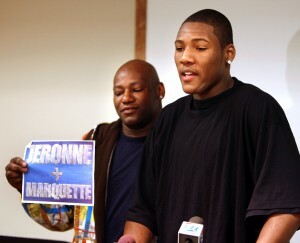 To read the rest of this article and other great stories on Marquette, click on this link that will take you to MarquetteHoops.com. As if the rivalry between the Marquette Golden Eagles and Wisconsin Badgers wasn’t big enough, it added a new chapter Sunday afternoon when Madison Memorial point guard Vander Blue gave a verbal commitment to play for Marquette next fall. The 6’3″ Blue was choosing between Marquette and Wisconsin with Florida, Arizona, UCLA, and Connecticut listed as well. Visiting Marquette on his official visit this past weekend, Blue attended Marquette Madness at the Al McGuire Center and sat next to now-fellow teammate and 2010 commit Jamail Jones, a 6’6″ guard/forward from Georgia. He was able to spend time with the current team, including former high school teammate and best friend Jeronne Maymon. Blue admitted there were many reasons why he chose Marquette over Wisconsin, including the up-tempo style of play that suits his skill set, his relationship with coach Buzz Williams, and the overall culture of Marquette. His decision did not come without criticism as many of the Wisconsin faithful feel betrayed and as if there is more to the story than what has been printed. Blue gave an oral commitment to Wisconsin after his sophomore year of high school but wanted to look over his options again after a breakout junior year. When the majority of 15-year-olds are deciding on whether or not to laminate their driving permits, Blue was deciding where to play division one basketball. It’s easy to see that he was young and excited, yet premature on his college decision. 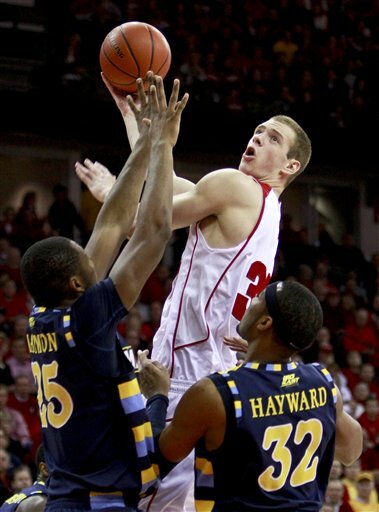 He never took Wisconsin out of his potential teams and it seemed as though his decision was 50-50 most of the way. Despite those upset at Blue for opening up his recruitment and then deciding to go to a rival in-state school, Blue says he could not be happier with his decision and is excited to be playing for the Golden Eagles in the Big East. Just as happier, if not happier, is Coach Buzz Williams who, in Blue, secured his second recruit for the 2010 season. Both recruits, Blue and Jones, rank in the top 70 on most recruiting websites and will play a major role when they join the team next season. 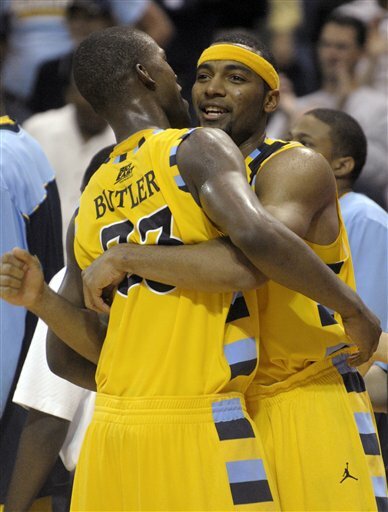 In an interview with JS Online Marquette blogger Todd Rosiak, Blue said that Williams was crying and screaming when he heard the news of Blue joining the Marquette squad. It seemed like a fitting end for the emotional Williams, who spoke to Blue about life and becoming a man over the weekend. He knows that being a Marquette Golden Eagle is about much more than wins, losses, and tournament bids. After Tom Crean ditched his seniors for Indiana prior to the start of last season, Williams was left to pick up the pieces that included two de-commits and not a lot of time to make up for it. 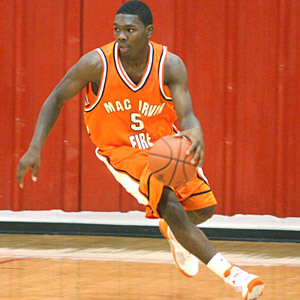 His first recruiting class consisted of junior college sophomores Joe Fulce and Jimmy Butler and freshman Chris Otule. 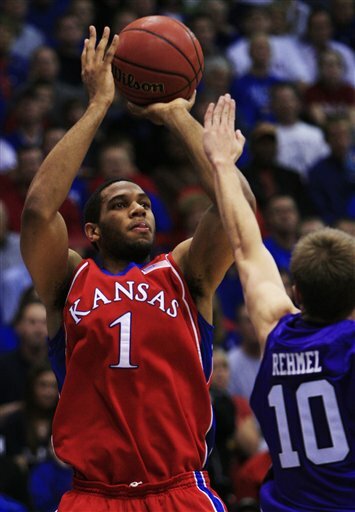 Williams’ Texas ties surely helped him out as all three players played in the Lone Star State. Butler came in right away and was an excellent role player for the Golden Eagles while Fulce and Otule fought injuries for the majority of the season. 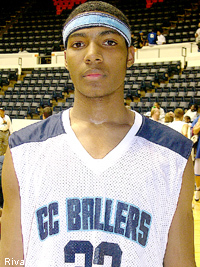 While Williams was given a free pass on his 2008 recruiting class given the circumstances, his 2009 class was going to define him as the class who came in after the Big Three of Jerel McNeal, Wesley Matthews, and Dominic James graduated. Williams did not miss a beat, recruiting three four-star players in Junior Cadougan, Jeronne Maymon, and Erik Williams to go along with three-star recruits Dwight Buycks, Darius Johnson-Odom and Youssoupha Mbao. Not only did the class balance out the roster with four freshman, a sophomore, and a junior, but it also ranked in the top fifteen on most websites. The class is yet to play a game, but the talent and chemistry seems to be there for the Golden Eagles to succeed in the future. Inexperience will play a factor and the newcomers are sure to have low points in the season and may hit a wall during the tough Big East season, but the learning process will be key for the future. Add last year’s class to the commitments of Blue and Jones for next season and you have a roster made up completely of Buzz Williams recruits, a five-star, blue chip prospect, seniors Jimmy Butler, Joe Fulce, and Dwight Buycks, four four-star recruits and a boatload of potential. The best part is that Buzz Williams is not done recruiting for 2010 with two more potential scholarships to hand out for next season. Look for Williams to solidify the frontcourt for next season as the backcourt is all but set up with Cadougan, Blue, Johnson-Odom, Buycks, Jones, Butler, and Fulce. Names for the 2010 class to keep an eye on include power forwards Tarik Black, Gary Mitchell, Jayvaughn Pinkson, and Freddy Aspirilla. If the Golden Eagles are to compete for a Big East title in the next two or three years, a big man who can consistently get looks at the basket in the low post will be key. Otule and Mbao are both centers who seem to have their game focused defensively right now so an offensive presence will be key. Whichever way you slice it, the Vander Blue commitment officially put Marquette back in the conference title talks for next season. 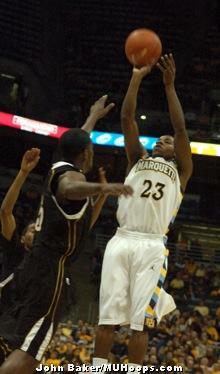 After all, he is the best recruit Marquette has landed since Kerry Trotter in 1981 and Doc Rivers in 1979. It’s big enough that the Golden Eagles have swiped up the state of Wisconsin’s best recruit the last two seasons,but if Williams can hit on another recruit or two for next season, Marquette can become a consistent top ten recruiting destination. Sorry I have been out of the loop on posting as of late. Midterms at school have had my head in the books and not as much on the blog. I have been following everything as usual and will have a lot to post on this week including the Packers’ shutout of the Lions, Vander Blue verbally committing to Marquette, and potentially some MLB playoffs as we prepare for the World Series. 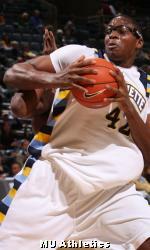 Here’s an article I did last week on sophomore big Chris Otule. 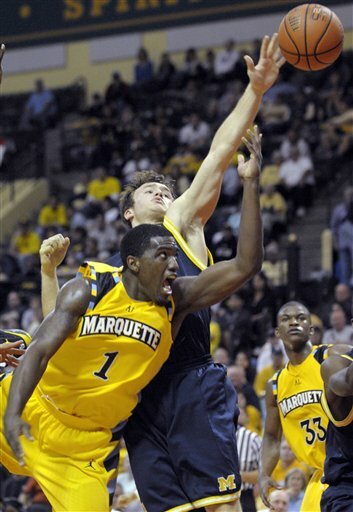 To read it, click on the link below that will bring you to MarquetteHoops.com, where most of my Marquette Basketball content will go from now on.